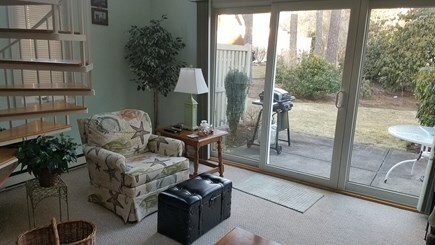 View of living room from dining room, sliders lead to patio. Patio with gas grill and dining for four. Beach: Minutes to Bay beaches and National Seashore. Pricing includes Massachusetts Rental Tax. Our home offers two-level living and is set up to sleep four. 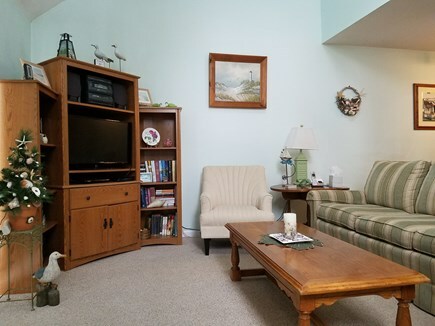 On the first floor you will find the living room, dining room, kitchen, bedroom with two twin beds, a full bath, and full sized washer and dryer. 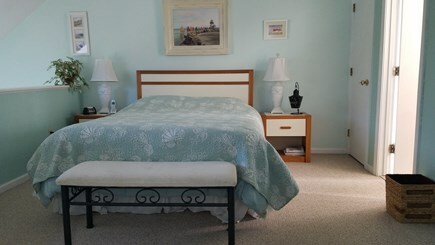 The master bedroom is on the second floor, has a queen size bed and its own full private bath. 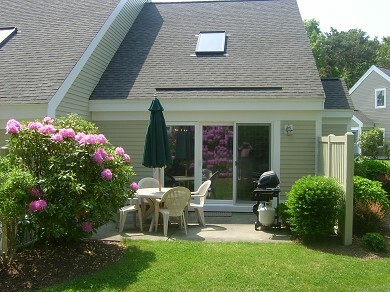 On the patio you will find a gas grill, along with table and chairs to accommodate four people. Nation wide long distance unlimited telephone service is provided. Internet service and digital cable TV service on 32 inch flat screen TV. ''Ocean Edge'' is located in the heart of Brewster and the Brewster beaches are only minutes away, travel a few more minutes and you will be at the Cape Cod National Seashore. Close by you will find golf courses that will satisfy every level of play. Cape Cod Summer college baseball provides the best summer college baseball anywhere in the country. How about summer music under the stars provided in most towns at no costs. Serenity season weeks available May, June, September and October. Great rates , no crowds, and yes you can make a left hand turns during serenity season. This unit does not provided pool passes, and you cannot purchase pool passes with this rental. New This year Massachusetts short term rental tax to be included in rental charge. 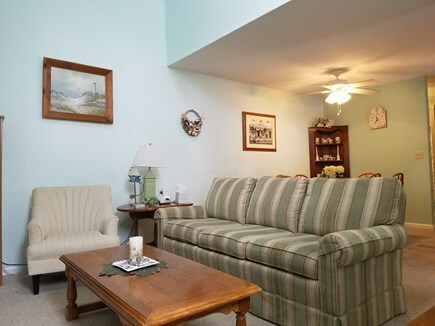 Nearest beach: Minutes to Bay beaches and National Seashore. Additional availability info: No daily rentals from June 23 through September 8. This is a Saturday to Saturday vacation rental. Additional pricing info: Cleaning Fee $150. State and local taxes of 14.45% will apply. First floor bedroom and bath. 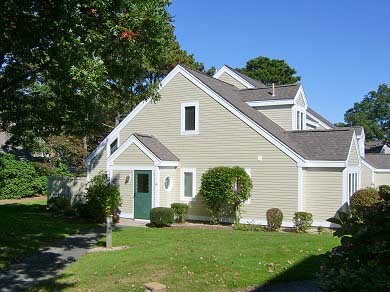 We have been coming to the Cape for 20 years with our family, and this was the best rental we have experienced. Extremely comfortable accommodations in a beautiful setting. Spotless with amble space to relax & enjoy! Owners were very welcoming offering helpful suggestions to navigating the wonderful Brewster locale. Hope to return next year! 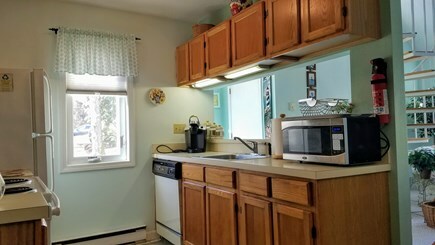 We thought this rental in Brewster was lovely. We were very comfortable, except that there was no air conditioning. It was a humid week and quite warm, so it would have been much better if the place was air conditioned. Other than that there were plenty of fans to help. There are spiral stairs to the second floor, where the master is located. Queen size bed, very comfortable. There were some condiments in the refrigerator which we appreciated. The resort neighborhood was quiet and well landscaped. The townhouse was an end unit and nicely equipped with supplies. Grill was functional and the propane tank was full. The owner was easy to contact and answered all questions. The week was peaceful and relaxing and our kids had a great time here. Only downside is that the owner is not a member of the resort and can not obtain pool passes for you. This really is not needed given the abundance of beaches, ponds and rivers in the area. I have only nice words to say about our stay in Clarence's lovely home. 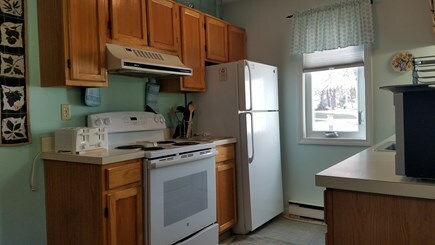 The place is nice and clean, spacious (about 1,000 sq ft), living room, kitchen, patio with BBQ, bedroom with 2 single beds and bathroom on first level and another bedroom with another full bathroom upstairs. We come to this place every year and have beautiful memories. This town house is part of the Ocean Edge Resort which is a 4-5 star resort with a lot of amenities, indoor and outdoor swimming pool, the Lynx tavern with excellent food and friendly service, tennis courts, basketball courts.... Everything you need for a nice family vacation!!! The town house, located in a very charming and peaceful community, was very comfortable and clean! 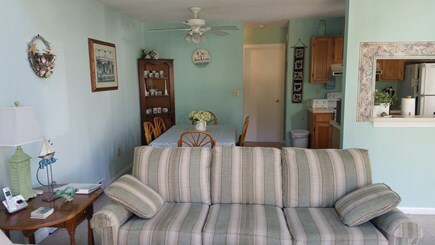 The unit was nicely furnished and fully equipped, which allowed us to relax and enjoy our vacation from day one! 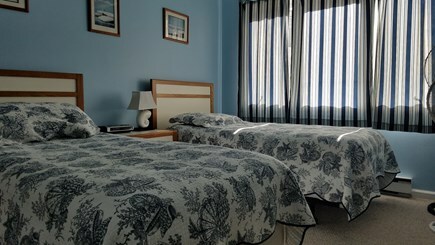 The owners were very generous and pleasant, and I would not hesitate to stay here again when we visit Cape Cod! We have owned this property for 18 years and look forward to residing here full time when we retire. This is a condo but is very private and quite at all times. Brewster is a great location, located in the mid cap area with access to the all the cape features. Best of all is the beaches, with the bay beaches only minutes away for the unit and National Seashore beaches only a short drive away. In Brewster you will find a great library, summer music, wonderful beaches, outstanding summer baseball and fine and affordable dining.